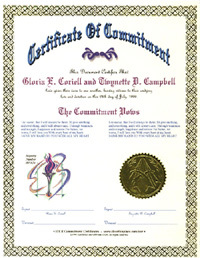 Entry into the official ICCR Register and a beautiful ICCR Commitment Ceremony Certificate with your own personal vows (up to 400 characters each) printed onto the certificate. To order, just fill out the form below with the information requested and we'll ship your package upon confirmation. If you want to order online, please go use the online form. Press the "Send Information" button. Get a Money Order and write your password on it. Make money orders payable to EcoPlanet. Note: Mail orders are not shipped out until after we receive payment in full. Funds must be in US Dollars. And the check must be encoded at the bottom. WARNING: Enter information as you want it to appear on your certificate. DO NOT USE ALL CAPITALS. Double check for accuracy after filling form! NOTE: If this begins to scroll, then you have too many letters. Please make up a password so that we can match your order with your money order. Send a Money Order or check and write the password on it that you made up above. Make money orders payable to EcoPlanet. Checks must be in US Dollars and be encoded at the bottom of the check. Note: Mail orders are not shipped out until after we have processed the payment. This form is only for Mail Orders!